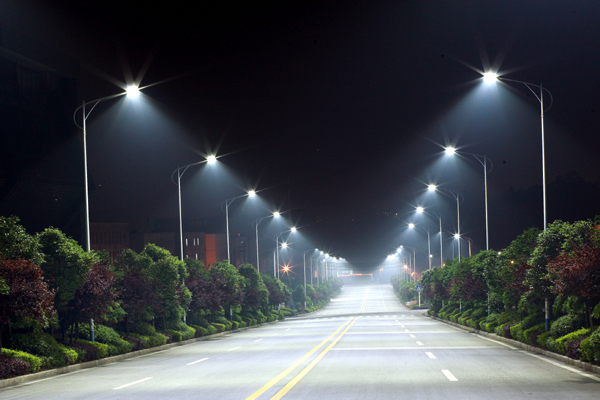 It is very interesting to note that the country intends to use Light Emitting Diode, LED to light up its streets by 2014. Light-emitting diodes (LED) are solid-state devices that convert electrical energy directly into light of a single color. LED do not waste energy in the form of non-light producing because they employ ‘cold’ light generation technology, in which most of the energy is delivered in the visible spectrum. It could offer long service life and high energy efficiency, although at this juncture, initial costs are higher than those of fluorescent and incandescent lights. LED street-lighting: Image - Soltron Corp. LED light can last up to 50,000 hours or 10 times as long as compact fluorescents, and far longer than the conventional incandescent. Very little maintenance is required through out the life span of the lamp. LED are filament-free, solid and robust. Thus, they are not easily damaged under the same circumstances where regular incandescent bulbs would. No mercury. More environmental friendly. LED's are made of non-toxic materials, unlike fluorescent lights that contain huge amounts of mercury and other hazardous material. Cold temperature is one of the challenges of fluorescent lights. On the other hand, LED light output and efficiency increase as operating temperature drops, making LED a natural choice for refrigerators, freezer cases and cold storage facilities. LED light produces more light per watt compared to incandescent light, a feature that would be useful in battery powered devices. In addition, LED light can emit an intended color without the use of color filters employed by traditional lighting methods. The following Table shows the comparison of the equivalent wattage and light output of Incandescent, Compact fluorescent, and LED lights. LED lights are fast becoming the light source of choice for many general lighting applications, such as architectural lighting, down lights, freezer case lighting and retail display lighting. Even street illumination using LED is quite a common sight nowadays. Due to the low power consumption of LED lights, they can be solar powered and installed off-grid at remote locations. Illumination: The distribution of light on a horizontal surface. Color Rendering Index (CRI): The Color Rendering Index (CRI) is a 1–100 scale that measures a light source’s ability to render colors the same way sunlight does. One thing has to be careful while using LED lighting is the power factor. Lots of LED are having power factor like 0.6. Most people are not paying attention to it as SESB doesn't penalize domestic users. With 0.6 of power factor LEDs is not much a saving than CFL, T8 or T5 using electronics ballast or induction lamps. For the time being, it is definitively energy cost saving for domestic users but not necessarily for the power utility. In my opinion in upcoming years, the user of LEDs will continue increase. LEDs represent the most significant development in Lighting since the invention of the electric light. LED technology is much more efficient, it did not produce UV light and extremely long life span. A single LED bulb has efficiency to may burn for 50,000 hours or more. LEDs have replaced the conventional lighting exposition for the multiple of reasons, particularly their extended life expectancy, reduced energy utilization and lower maintenance requirements.